For the last four years, Eleanor Roosevelt MD senior Tasha Stanley has been a mainstay on the renowned Roosevelt and Blazin' Raiders teams that have literally rewritten the top ten lists for relay events up and down the distances. Under the tutelage of Coach Desmond Dunham, Stanley and her teammates have authored everything from Penn Relays triumphs to Nike Indoor Nationals sweeps to Nike Team Nationals appearances. Last weekend, at the New Balance Collegiate Invitational, Stanley and her batonmates were at it again, winning three stick events and equaling the #2 time ever in the 4x800. Although she's one of the top 800 talents in the nation, Tasha routinely subjugates individual goals for the collective glory of what is year after year one of the top girls relay groups in the country. Now a senior bound for the University of North Caroilina, and captain of the track team, Stanley and her teammates will have the big relay events firmly in their sights this winter and spring. DyeStat assistant editor Dave Devine pries this team-minded star away from the exchange zone long enough to find out where that team commitment and selfless approach comes from. 1) First off, great job on the relay carries at the New Balance Collegiate meet last weekend. You must have been tired after 3 relays, but you managed to hold off Nadonnia Rodriques from Boys & Girls NY on that 4x400 anchor. How did that leg unfold for you, and what were you thinking, knowing such a talented runner was hot on your heels? Well, coming into the race I already knew that my legs were going to be heavy, just from my previous races. However, I knew I was ready. This is what I work hard for, opportunities like this to push my body to the limit in order to maximize my potential. Coming into the race I understood that I was going to have to rely on my strength to carry me through and that’s what I did. Truthfully, in the race I wasn’t worried about Rodriques being hot on my heels because I am confident in my ability to finish strong. 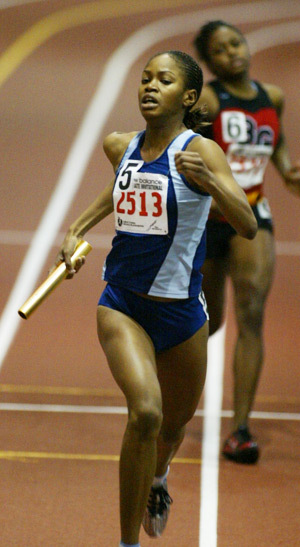 2) A lot of people may have been surprised to see Eleanor Roosevelt come out so strong this indoor season, after graduating the Jameson sisters and Marika Walker. Yet you just equaled the #2 US time ever in the 4x800. Did you expect your team to rebuild so quickly, and be ready to put up such fast times? Has it been a matter of younger runners stepping up, and seniors like yourself and Dominique Lockhart taking on more leadership roles? After the departure of the '07 graduating class, I was aware that we were still a force to reckon with. Younger runners, and then soon-to-be seniors like Dominique (Dom) stepped up to be leaders on the team. I accepted the responsibility of being captain of the track team as well. With experience from seniors like myself, Dom, and our continuous drive to be successful, I knew that we were going to come back strong. So at last weekend's meet, it came as no shock to us that we ran the times that we did. 3) After those New Balance Collegiate victories, your coach, Desmond Dunham, talked about the ER program as a whole, and how each group of girls passes along their commitment to the next group. Can you talk about what it has meant for you personally to run at Eleanor Roosevelt? How has it shaped you as a person? Personally, to be able to run on the Eleanor Roosevelt Track Team has been an honor. I am thankful to have teammates, parents, coaches, and school faculty members who care so much. These people take so much of their time to help us student-athletes to be better people on and off the track. I have a lot of respect for them. Throughout my high school running career I have learned many life lessons that have made me a better person. One of which is to believe in myself through all of life’s challenges and tribulations. Our team is used to facing unbelievable odds, so we learn to rely on our inner strength and our mental strength to pull us through. We’re more than a team – we’re a family. We’re getting prepared for life so that we can be successful at whatever we choose to do. It’s about more than winning races – we want to win in life! 4) I just watched the video of you anchoring Eleanor Roosevelt to the 4x800 Championship of America at last year's Penn Relays. You never led against the anchor from Holmwood Tech (Jamaica) until the final strides. It looked like it took everything you had, and then some, to pass her. Where does that ability to dig so deep come from? What makes you say, 'I'm going to pass her,' instead of, 'I'll settle for second'? How helpful was it to have the Penn Relays crowd whooping like crazy as you went to pass? To tell you the truth, digging deep comes naturally for me. With anything I do, whether it be go-cart racing, running, or school, I am not going to settle for less than the best. I was not going to let my team down. The coaches decided for me to anchor because they knew I could bring the baton across the line in first no matter what the situation. Having the crowd whooping did actually help drive me past the other runner. 5) Speaking of Penn Relays....you've run at Penn, Nike Team Nationals, Nike Indoors and Nike Outdoors, Arcadia and Mt. SAC and everything in between. You've set national records and won national titles with your relay teams. What's your favorite win or weekend so far? How about your favorite place to race? 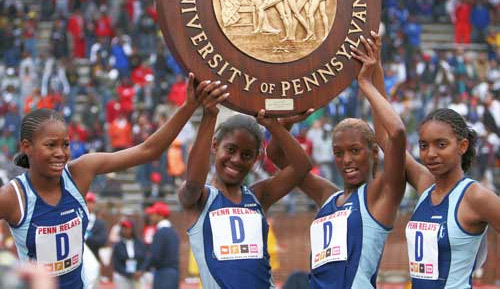 My favorite win was the High School Girls 4x800m Championship of America at 2007 Penn Relays. Penn Relays is my favorite place to run; I have only one opportunity to run on this track a year and I get to run in front of a large crowd of people from all over the world that love the sport of track & field. The best team trip was competing at Arcadia and Mt. Sac, spending the week bonding with my teammates in California. 6) It seems like the strength of ER in the past few years has been as a team. Certainly there have been standout individuals, but nothing like what you all have accomplished on various relay squads. Where does that commitment to relays come from? As one of the better 800 runners in the country, are you ever tempted to ask if you can skip the relays and take a shot at someone like Chanelle Price when you're fresh? To just train for individual success? Our commitment to relays comes from just having a close team that loves participating in relays. We definitely believe in the idea that greater feats can be accomplished as a team than as an individual. There’s nothing like four athletes willing to do whatever it takes in order to run for their team on a relay. I think about running individually all the time, but I will have plenty of opportunities to race these key athletes in the future. An opportunity to run on a relay with your teammates and go after national records at key meets comes rarely. 7) You just signed a letter of intent to attend the University of North Carolina and become a Tarheel. What drew you to that school, and what factors went into your college decision? I’ve always had an interest in the University of North Carolina. The school is known for producing great middle distance to long distance athletes, and for cultivating scholars in many disciplines. In my college decision a major factor was finding a school that is top in the country in academics and athletics. UNC track team has great family atmosphere just like my high school track team. Also, I feel very comfortable at the university and I know that the coaches have my best interest in mind. 8) If you had to assemble an Eleanor Roosevelt all-star team of girls you've run with (yourself included), to take on any 4x800 relay team in the country, who would you pick, which legs would they run, and why? I have so much respect for the veteran runners, and they would make a great all-star team, but I would have to choose the 4x8 that ran at New Balance (Dom, Brittany Ogun-Mokun, and Amirah “Mimi” Johnson) and with the same order. We’re on the verge of a really great season and we’ve bonded so well. Our squad has a drive for success like no other and this is a team that can be taken anywhere and run with the best teams in the world.